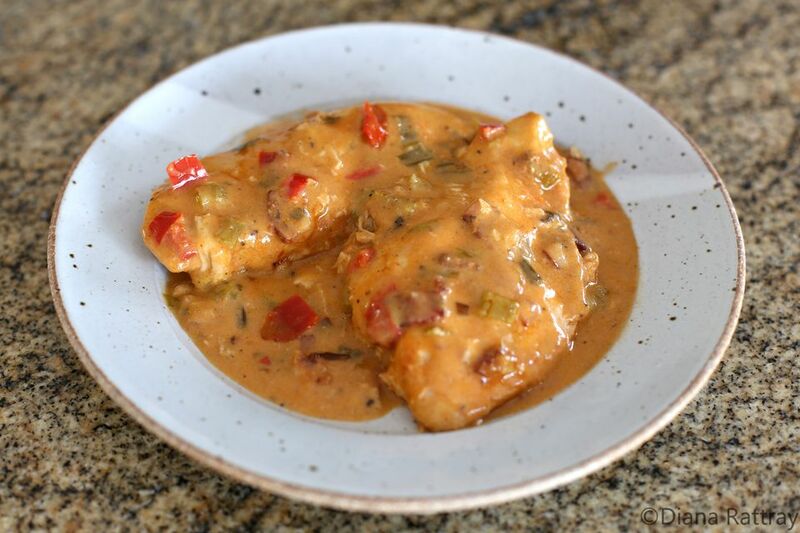 These crock pot chicken breasts get their flavor from Creole seasonings and a creamy sauce. Onions, bell pepper, and celery get together with bacon to add flavor to this tasty chicken dish. Some cream or milk is stirred into the sauce near the end of cooking time, making a flavorful "gravy" to serve along with the chicken. Serve the chicken and creamy sauce with rice or pasta or with roasted potatoes. Add a steamed vegetable or a salad, and you have a complete meal. It's an excellent family dish, and the slow cooker makes it practically effortless. The onions, bell pepper, and celery make up the "holy trinity," a trio of aromatic vegetables (a variant of the classic French mirepoix) associated with Cajun and Creole cooking. Melt the butter in a saucepan over medium-low heat. Add the onions, bell pepper, celery, and bacon. Cook, stirring, for 4 minutes. Add the flour and continue cooking for about 3 minutes longer, stirring constantly. Add the chicken broth and cook until thickened. Add the tomato paste and Creole seasoning; blend well. Spoon the sauce mixture over the chicken breasts. Cover and cook on low for about 5 hours, stirring about halfway through the cooking time. Stir in the cream or milk about 15 to 20 minutes before the dish is done. Serve the chicken and sauce with hot cooked pasta or rice. *If the Creole seasoning is salt-free, taste and adjust the seasonings when you add the cream. This recipe was originally made with just the bacon and green onions. Recent additions include bell pepper and celery, which, with the onions, make up the "holy trinity" you'll find in many classic Cajun and Creole dishes. Feel free to tailor the dish to suit your family's tastes.